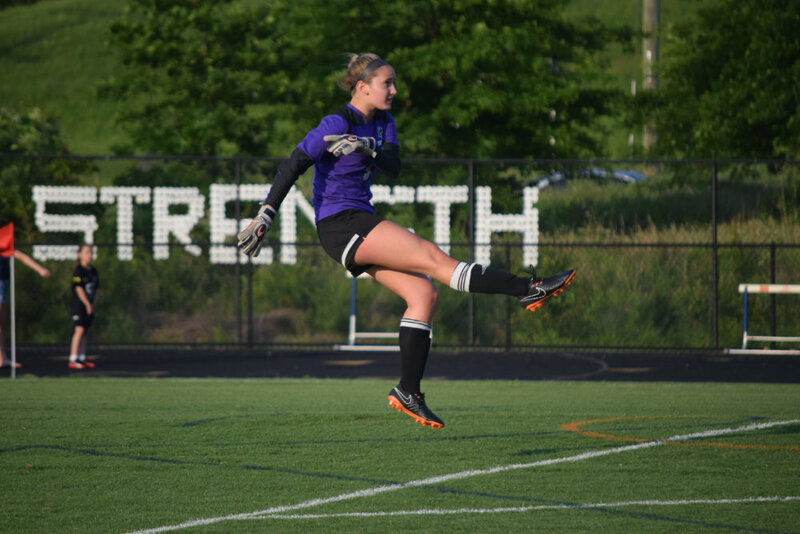 Potomac Falls senior goalkeeper Jessica Touve was tremendous in the net for the Panthers, allowing just a single penalty kick, during the Potomac District championship on May 25 in Ashburn. Full photo gallery by Owen Gotimer! 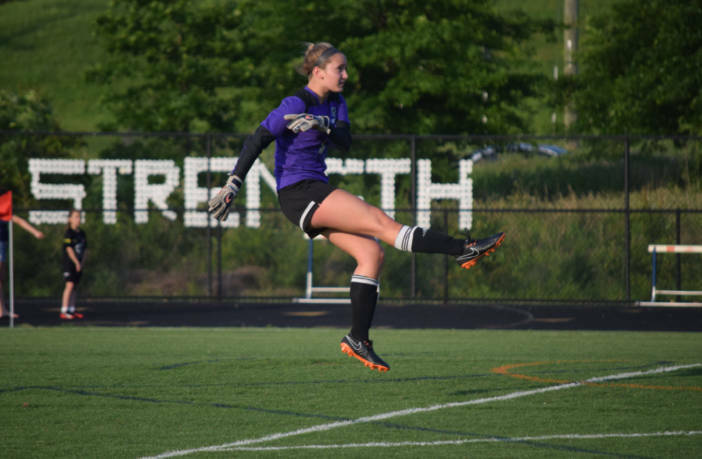 Sterling, Va. — Potomac Falls High School senior Jessica Touve has made a commitment to continue both her soccer and swimming careers at Bridgewater College starting in the 2018-2019 academic year. Throughout her 14 years of competing, Touve has been working hard to better herself on the soccer field and in the water. Touve is a part of Herndon United ’99 Soccer Club, which most recently won the Women and Girls in Soccer, NSCAA Los Angeles College Showcase, Disney Soccer Showcase and Bethesda Premier Cup tournaments. Herndon United ‘99 is also a three-time Virginia State Cup finalist. The future Bridgewater goalie was also chosen to represent WAGS on an all-star team that traveled to England this past year. 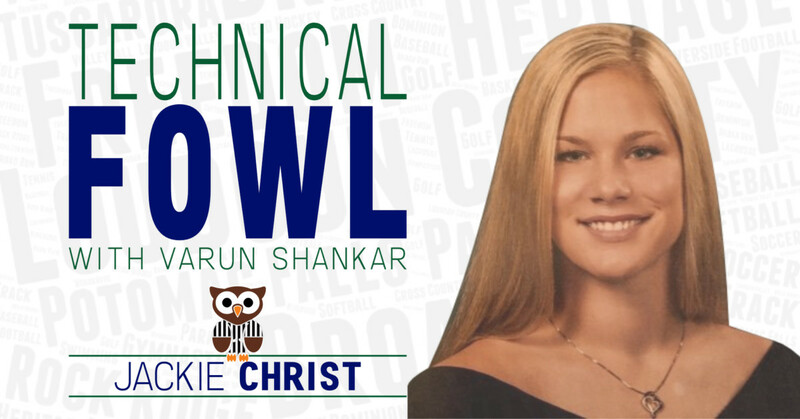 As a swimmer, Touve has qualified for the Junior Olympics several times over many years and competed in the VHSL 5A State championship all four years of high school. Touve has stayed focused and motivated in both swimming and soccer. The soon to be Bridgewater Eagle says that she is always looking up to people who have more experience than her and tries to learn as much as she can from them. “Coach Jessica Fry was my swim coach for many years during morning practices and has been my most influential swim coach,” Touve said. “She would always make sure that everyone was working hard and would also let you know if she thought you were slacking off. She always pushed me to do my best and made sure all of my techniques were there. Led by head coach Gwynn Harrison, the Division III Eagles swim team placed third at the Old Dominion Athletic Conference championship in 2018. The Eagles’ women’s soccer team enjoyed similar success this year under head coach Mike Van Horn, who led Bridgewater to a 16-5-1 fall, including a trip to the ODAC tournament championship. Chloe Adam is a senior at Loudoun County High School in Leesburg. When she is not playing or coaching on the volleyball court, Chloe enjoys reading, writing, traveling and spending time with her friends and family. In fall 2018, Chloe plans to play volleyball for Salisbury University.